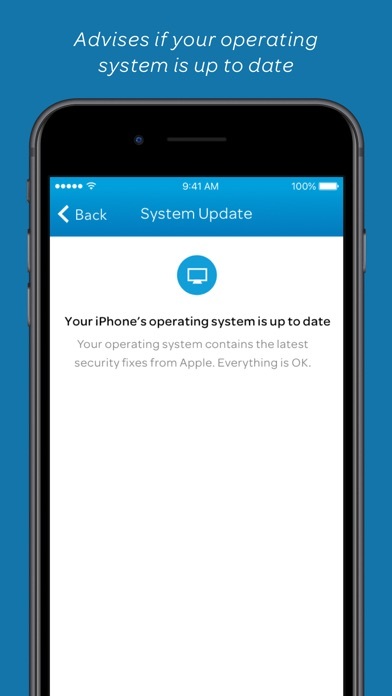 AT&T Mobile Security Enjoy additional peace of mind with AT&T Mobile Security AT&T Mobile Security Basic (FREE) System Update: Keep up to date with operating system changes with reminders. Passcode Check: Ensure you have a passcode to help keep your device and data secure. NEW! 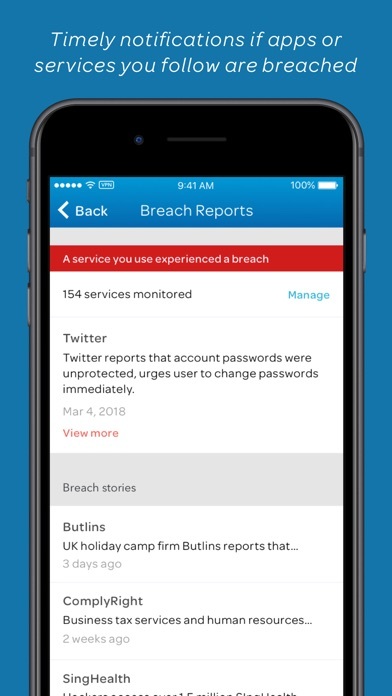 Breach Reports: Get alerts about company data breaches, along with helpful tips. 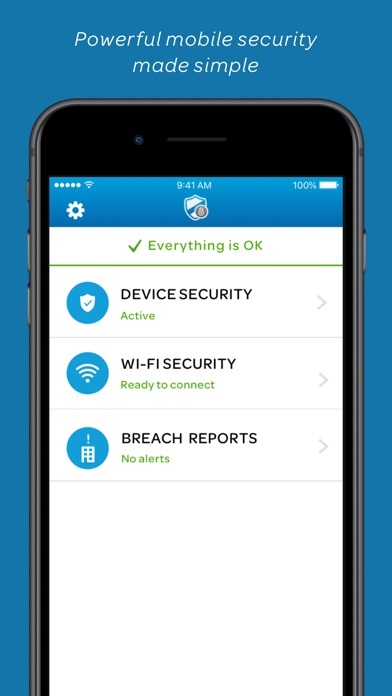 AT&T Mobile Security Plus (In-app purchase): AT&T Mobile Security Plus includes all the functionality of AT&T Mobile Security Basic, plus more features to help protect against threats that could compromise your personal information. 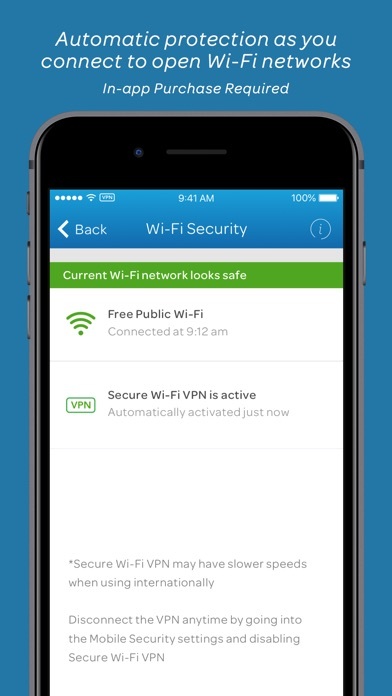 Secure Wi-Fi VPN (Virtual Private Network): Helps protect your data over open (unencrypted) Wi-Fi networks. NEW! Wi-Fi Alerts: Get alerts when a Wi-Fi network you join may be dangerous to help protect your privacy. ** AT&T Mobile Security: Some features vary by mobile carrier. Eligible AT&T customers receive automatic fraud blocking and warnings of incoming nuisance calls (Basic), and Enhanced caller ID for US numbers (Plus). AT&T Mobile Security PLUS: Subscribers pay $3.99/mo. Auto-billed every month through your iTunes account unless canceled. Subscription automatically renews and your account will be charged $3.99 unless auto-renew is turned off at least 24-hours before the end of the current period. To manage your AT&T Mobile Security Plus (“Plus”) subscription, go to iTunes. Once your Plus subscription is canceled, you will be downgraded to the basic free version of AT&T Mobile Security. To remove the service entirely, you must cancel within the app or via myAT&T, once your iTunes subscription ends. Rates: Data charges may apply for app download and usage. Other charges and restr. may apply. Payments are nonrefundable (subject to applicable law). For complete terms for AT&T Mobile Security, see att.com/mobilesecurityeula. It’s nice to know when the scam or invasive call is going on!! I cancelled the service, due to it wasn’t working as stated. Although I never deleted the app from my phone. While at my son’s home, my phone would connect to his WiFi and then immediately disconnect. I noticed the VPN kept toggling on and off. It finally occurred to me that this app was still on my phone. I deleted the app and now my phone connects to my son’s secure WiFi. Ironically, the reason I cancelled the paid service associated with this app, is the VPN would not turn on when I was using public WiFi! Great job for effort. Please add support for cellular iPads on the AT&T network. Sometime vpn get stuck in when using a secure WiFi network. Sometime you have to turn off cellular to get the WiFi to connect with the vpn. Small bugs. The free version only tells you that your iphone ios is up to date, and that you have a phone password set. Thats it. It worked fine the first 2 days now im going to get rid of it because I got a lot more marketing phone calls than before. Can’t see that it dies anything that it says it’s going to do. $3.99 per month, $48 bucks a year just not worth it. This app is a P.O.S. ATT wants to charge for any type of useful information to use. Now always crashes when I open it.... ATT needs to grow up and help it's customers with more useful stuff that we can get free to use else. Got a new phone to replace broken old phone....same model phone. I can’t use the app on this phone. More by AT&T Services, Inc.